I like that a lot. But what makes a low floor? 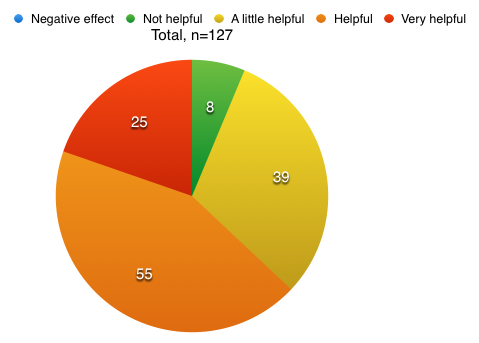 Probably depends, but you must make sure that every student in your class can participate in the beginning of the lesson. The more interesting the hook the better. Can you get a debate going during the introduction of the lesson? … have more than one way to figure it out. It doesn’t have to have lots of ways – even if there are only two ways that’s still good. It’s important to be able to compare and contrast approaches. 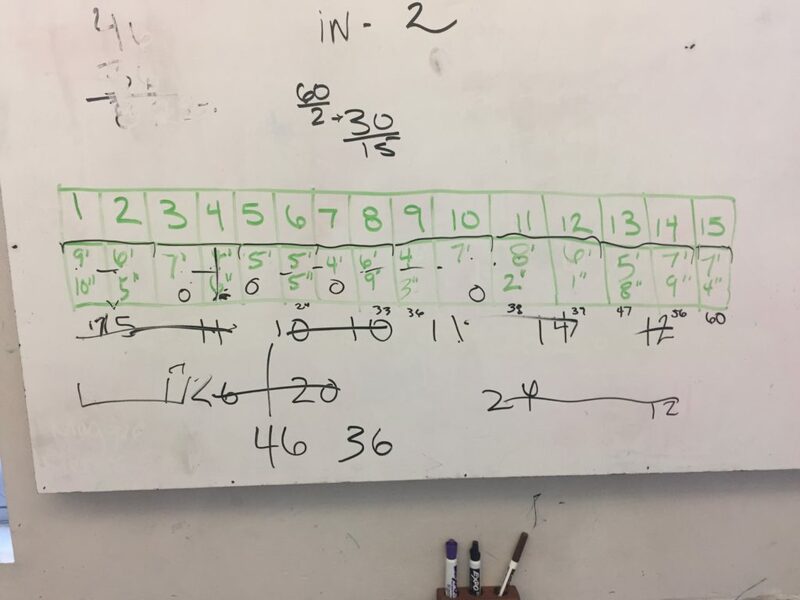 Sometimes this “open middle” if you will is only apparent for part of the lesson. For example, I have students measure the height of our stadium lights using an inclinometer. They take measurements from two different distances. This lesson is awesome, but there is only one way to do it. 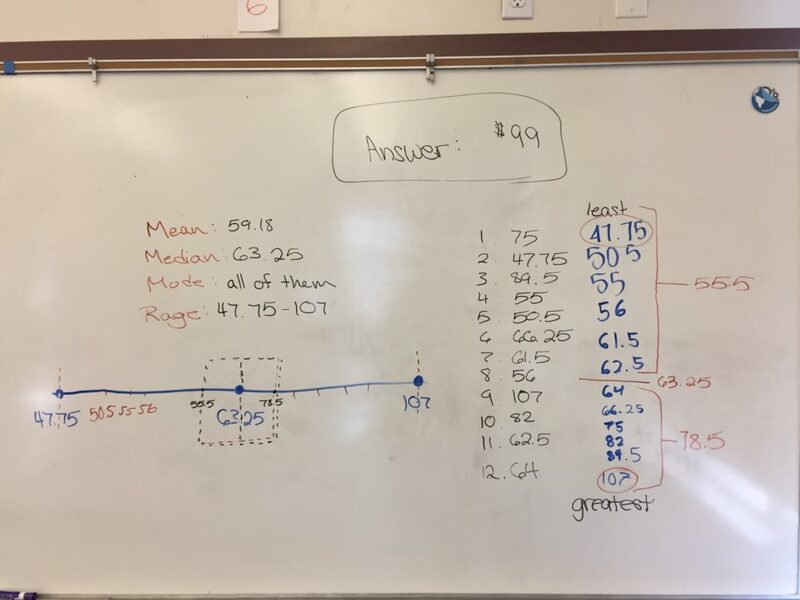 After they get their two answers (one from each distance) I ask them “Which distant do you think is more accurate?” Now we have opened up that problem a lot. The main content outcome had only one way but you can bring in an openness by the questions you ask throughout. … are ones where you don’t immediately know how to do it, but you think you can figure it out. This is a subtle place. The book “Make It Stick” labels this as “desirable difficulty”. 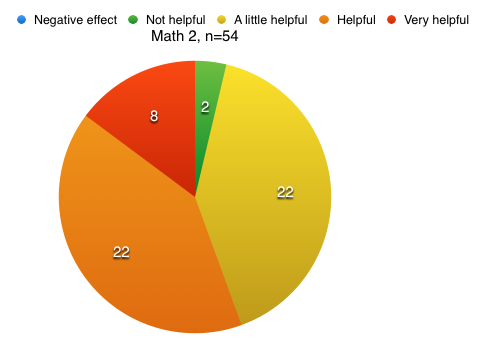 It’s hard to put your figure on what makes this true but there are definitely questions that students get where they say ‘I don’t know how to do this and it’s too difficult for me to figure out”. And that is not a clear constant line for every student but you don’t want anyone in the room thinking that at the beginning of a lesson. Ms Pac Man hits this mark pretty good. Students generally don’t know how to get her all along that path but they believe they can do it. So when they hit that first turn where she reflects and rotates they are like “this is strange”, and they immediately move into trying to figure out that turn. They believe they can do it with effort and collaboration. Pro – tip. You must help them without thinking for them. 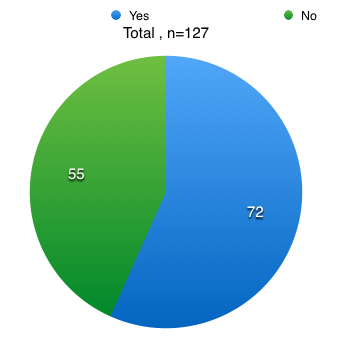 So you must know how they are thinking…. so you must listen to them and not assume that you already know what they are thinking. 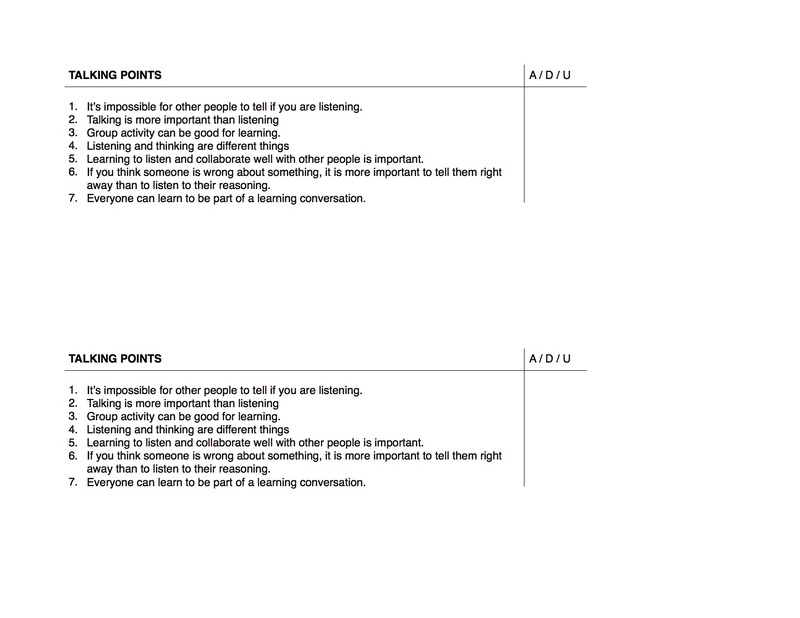 Lastly, frame all hints as “break throughs” and attribute them to the students and groups where the idea emerged from. … have a surprise ending. Anytime our intuition turns out wrong become intrigued. Almost like we don’t believe it or something (“No way – this can’t be right”). One of my favorite examples of this occurs during Mathalicous lesson “As The World Turns”. 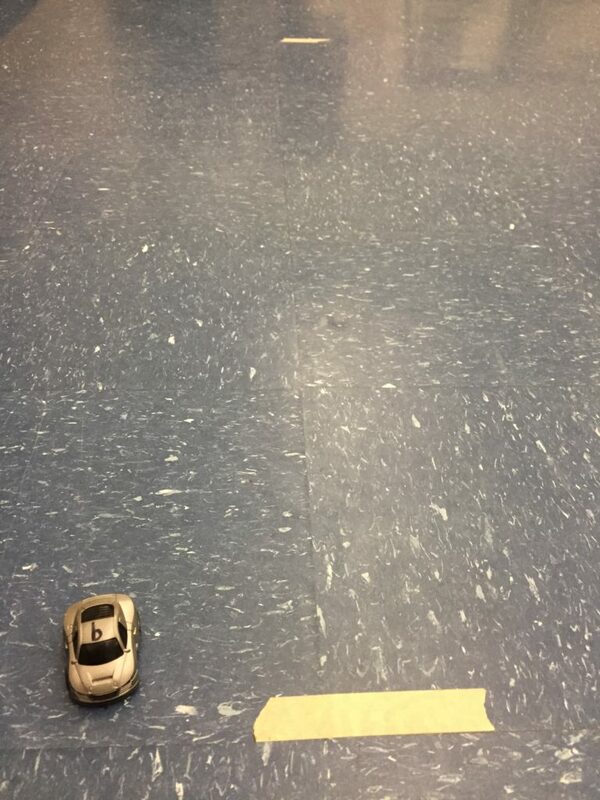 After students calculate the speed someone on the equator is moving due to the earths rotation you point them to where they are located on the graph and ask “Are we traveling at the same speed, faster, or slower than someone on the equator?” The students who believe we are traveling at the same speed eventually sit at the edge of their seats when they learn they are wrong. It’s time to be convincing and go for that ride. … allow for conversations that are important irrespective of the mathematics, use technology, have manipulatives, ask students to measure and collect data, have students create something, connect art & mathematics, …. It’s interesting, I have having some trouble differentiating between the elements of a great lesson, and elements of great teacher moves. Most of the ideas that are coming to mind feel more like teacher moves rather than static elements that exist naturally within a lesson. I ended up having this go over two days and looking back I’m very glad I did. 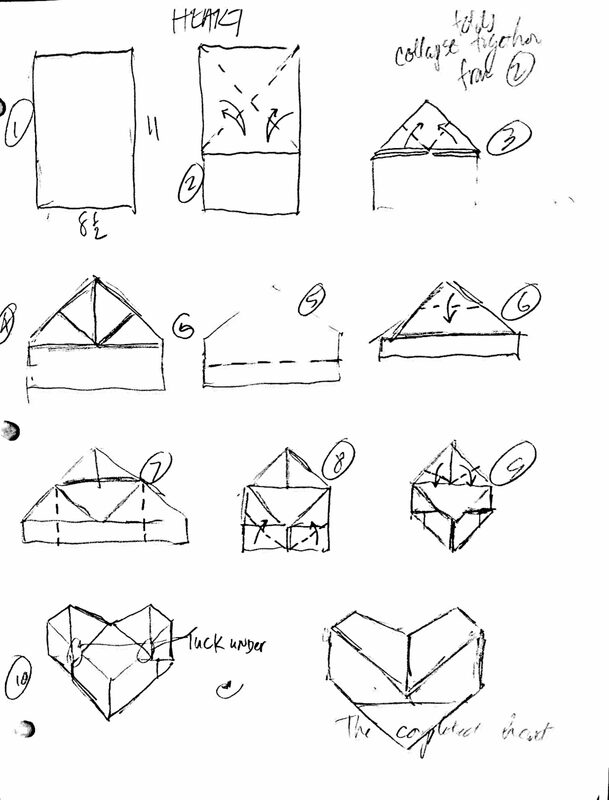 Here are my notes for day one of the lesson which is where they folded the model. For specific folding instructions – go over to georigami.com and watch Dave and I fold the duck. I recommend watching the “For Educators” video. When I write out my plan I like to be very direct my main focus – but I also note any questions I want to pause on that aren’t part of my main content goal. 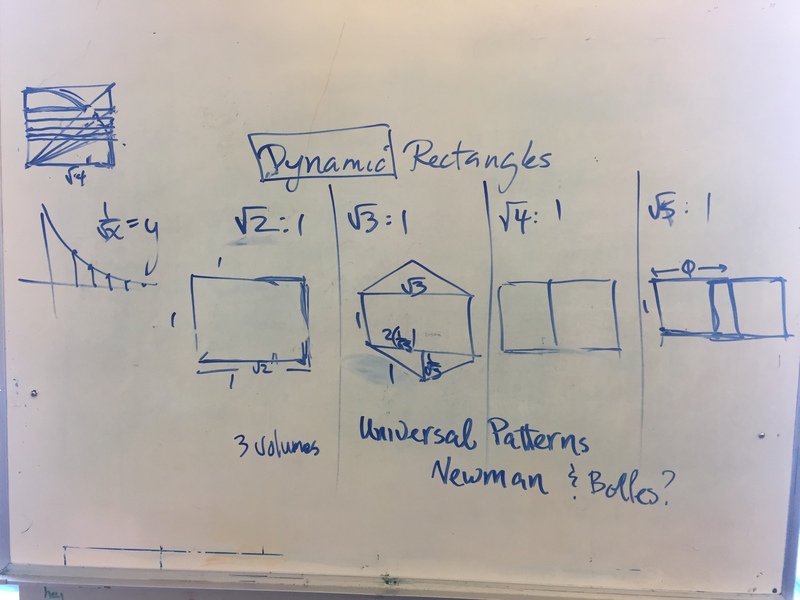 So in this case – my main goal is the angle bisector and angle measures, but you can see I have carved out a specific time when I am going to deviate from that and do a ‘what do you notice’ on the step when they first fold the kite. Day 1: Fold the duck and find all missing angles. Not worrying about having to provide justifications (warrants) and notation. 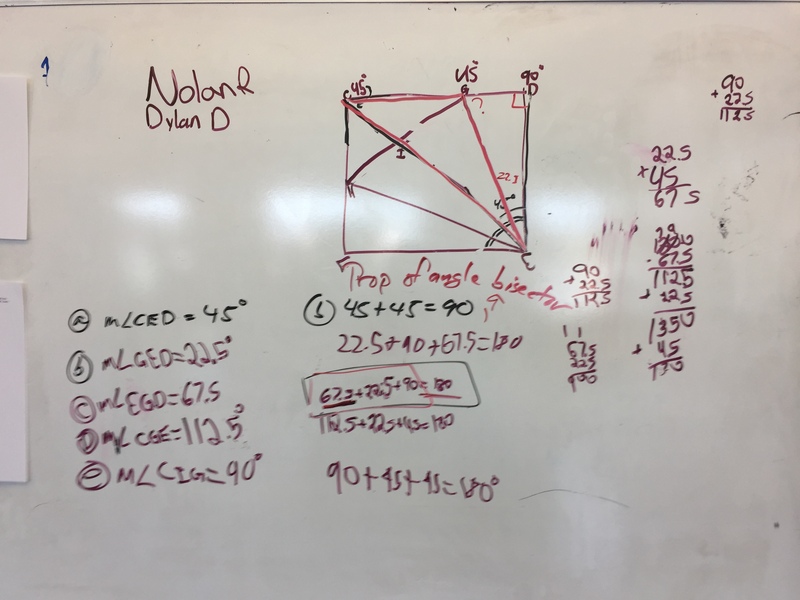 I focus on introducing the angle bisector because ultimately they are going to be solving for angles and almost each one is specifically related to a bisecting. 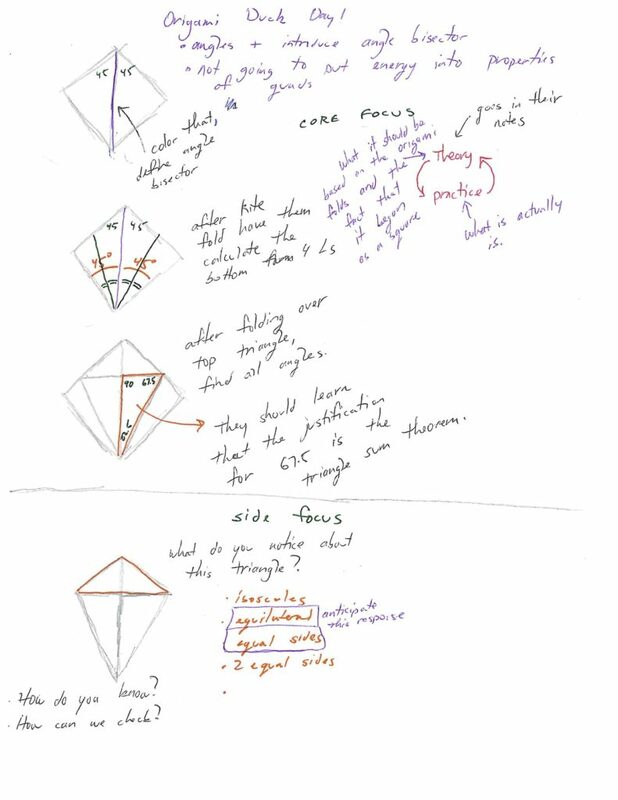 As I show in my notes – I did pause after each bisecting and had them figure out what the resulting angles were and mark the angles as congruent directly on their origami model. I gave them individual time to figure out the angles right there on the origami model. 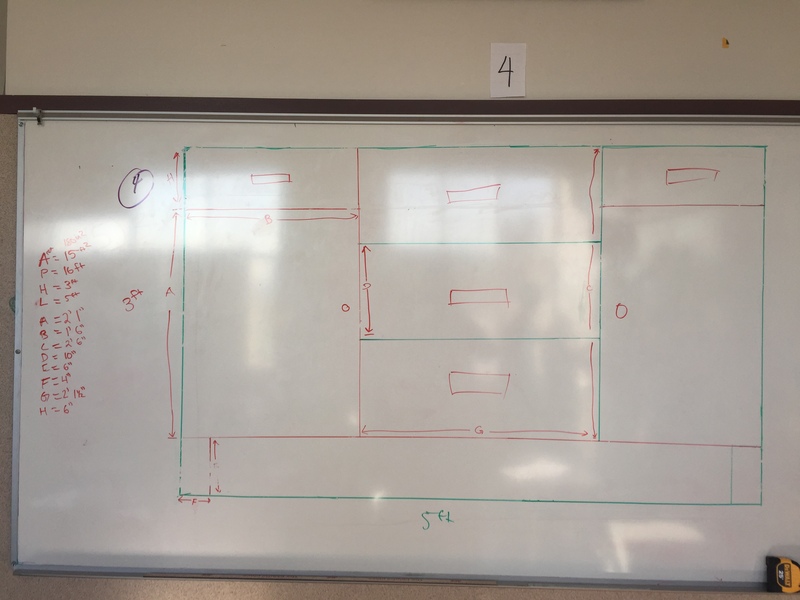 Then I grouped them and they went to whiteboards, drew the model on the board and solved it in teams. I had a couple of the folding patterns printed out to help them draw it. 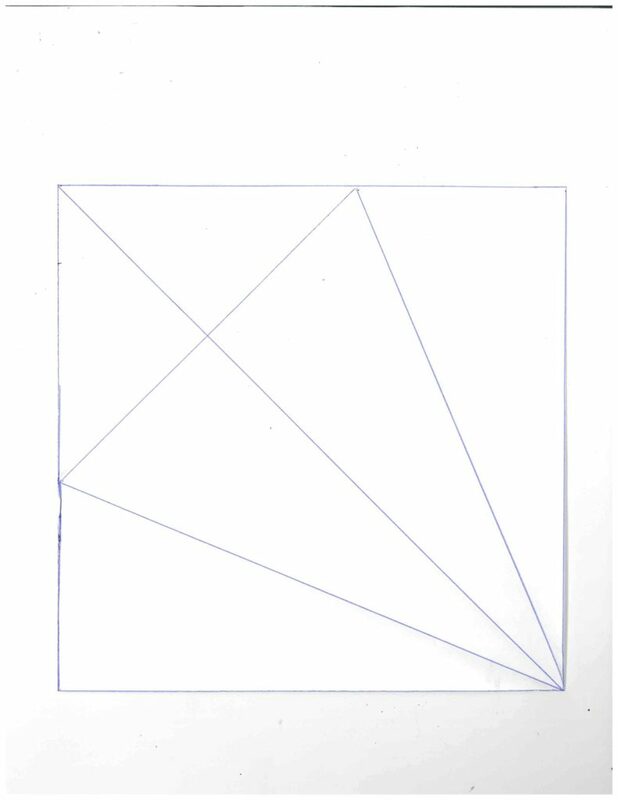 Just drawing the fold patterns is a lesson in itself since they have to draw the best square they can, and then attempt to properly bisect the angle. 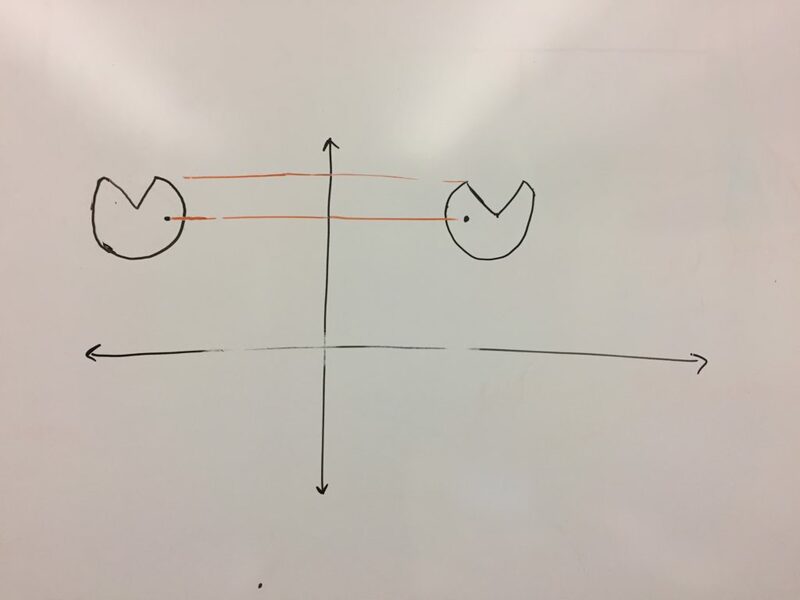 To draw a bisector you must understand a bisector. I intentionally used the folding pattern without labels because I didn’t want anything to distract from figuring out what every angle was. But I suppose you could label it with points. Day 2: No folding, they just completed the Origami Duck worksheet. 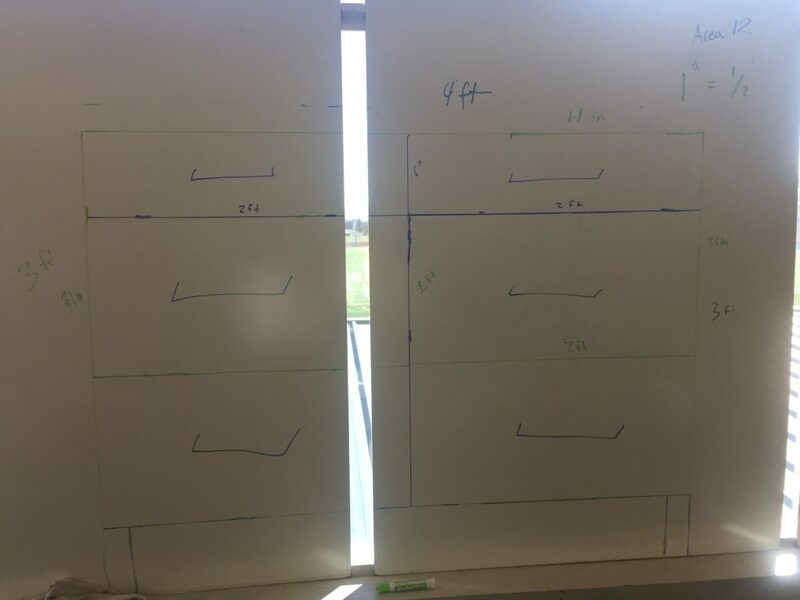 I had them do it all at whiteboards, but having them work it on paper is cool too. The idea is that now they are using proper notation, and needing to provide warrants for each claim (unlike day 1). 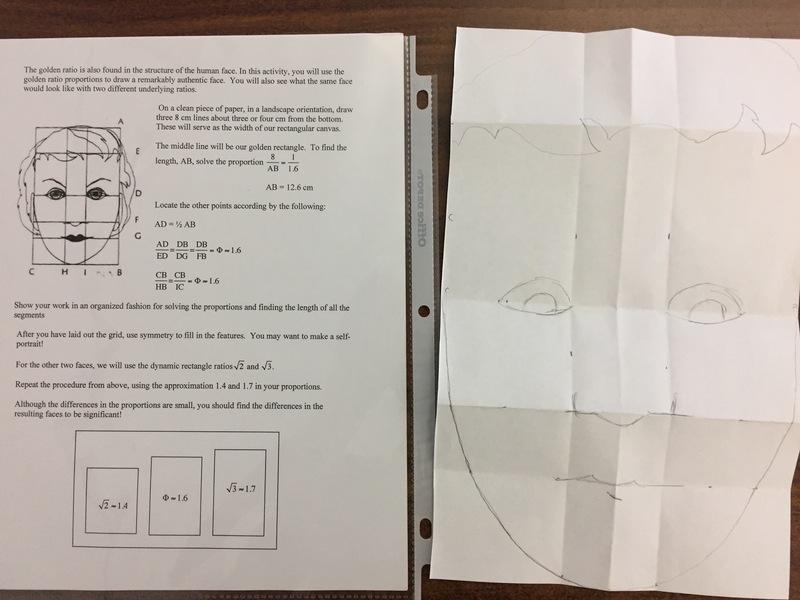 I used the worksheet from georigami. 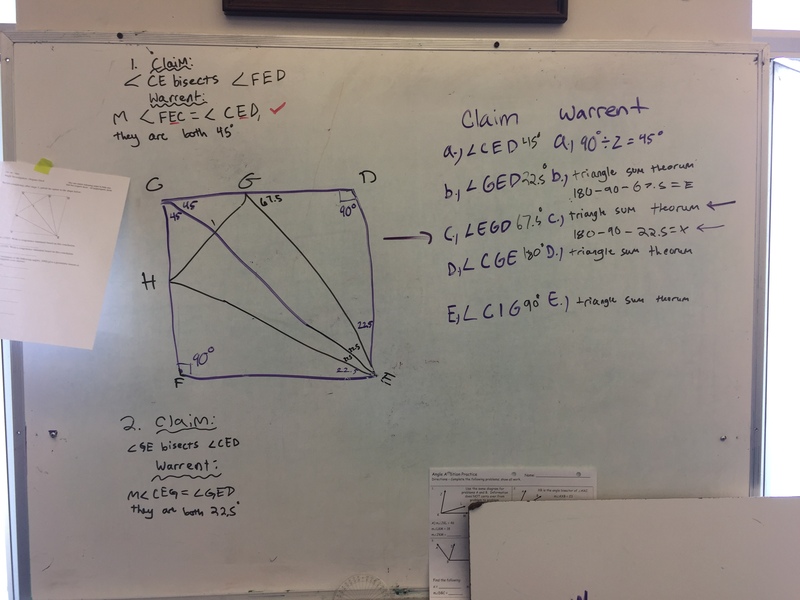 I added the structure of CLAIM/WARRANT because that is the language we are using this year. 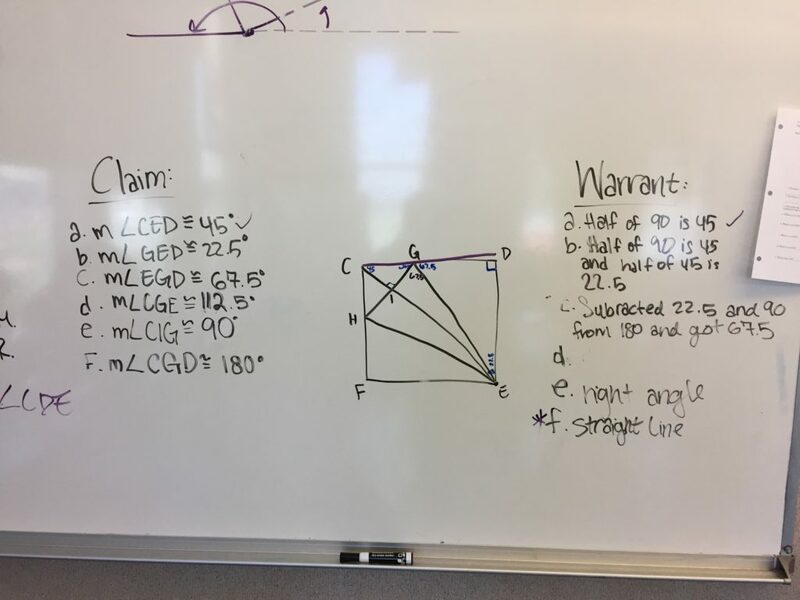 The reason I broke it into two days is because this is the 4th day of the year and I didn’t want the structure of CLAIM/WARRANT or the notation of defining angles to get in the way of their conversations about the value of each angle. 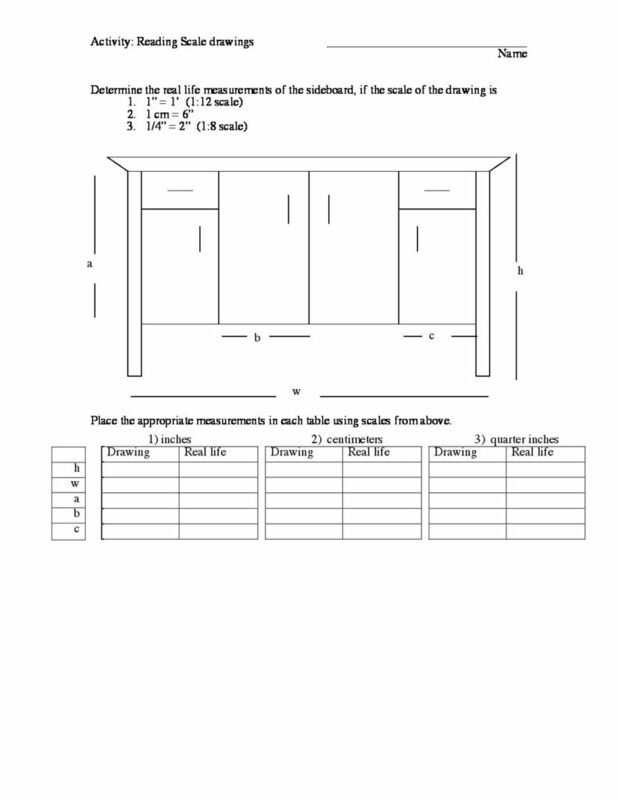 The second day they needed to find specific angles called out in the worksheet, and format it in a two column style with CLAIM / WARRANT. My goal at the end of the 2nd day is to take the students around the tour of the room and look at the justifications. I am looking for a group whose warrants are only the algebra steps they used. 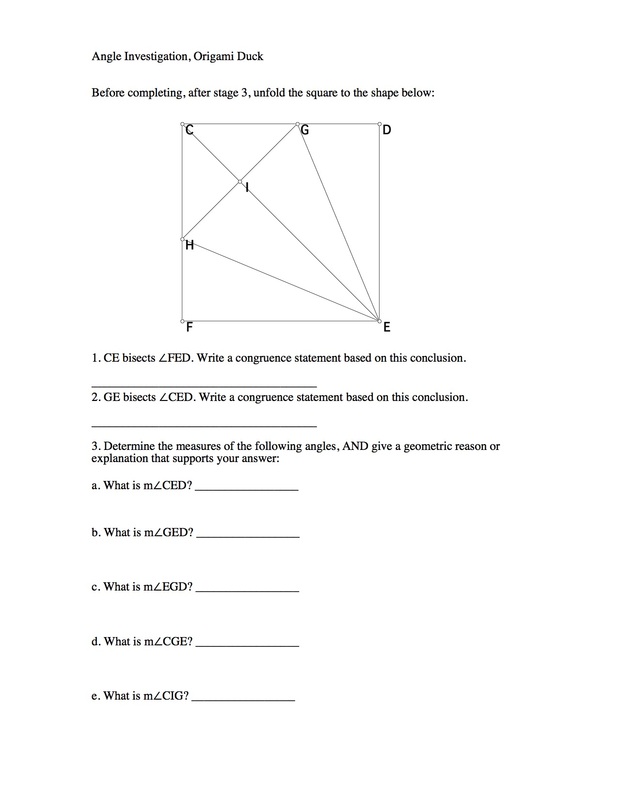 Then I’m looking for a group who might have described what they did in words – “we cut the 45 degree angle in half”. 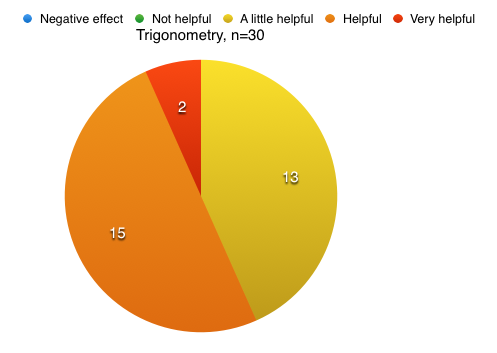 I would like to find a group that justified their responses with theorems (property of a bisector, triangle sum theorem) but didn’t show algebraic steps. And lastly a group that did both – like one of the ones pictured below. 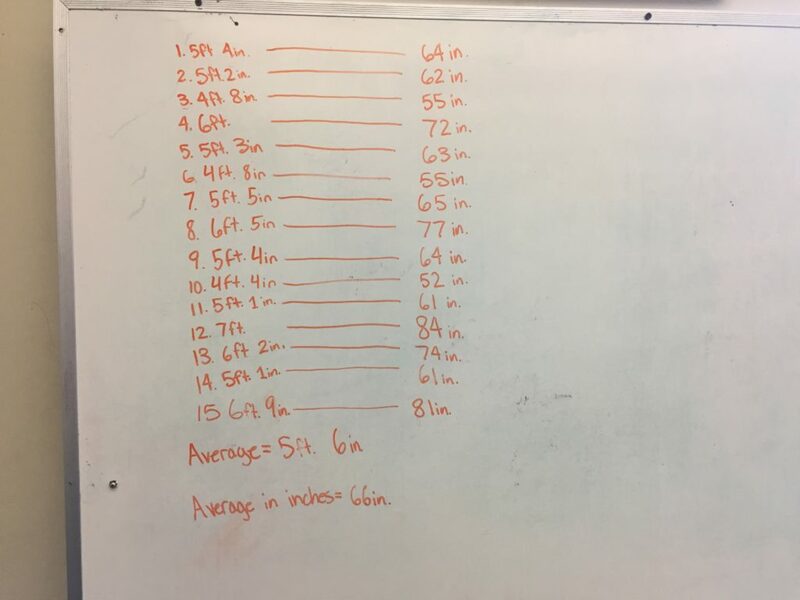 Is it one thing to say the reason the angle is 67.5 is because 180-90-22.5 = 67.5. But why does that algebra produce the correct answer? What do you say to the person who doesn’t understand what gives you the right to do that? You need to do more than just show the algebra, you must quote the theorem that supports the steps. Oh, I need to justify my algebra steps. I have them put it in their notes. It’s fundamental to my origami lessons. Here’s why: When you ask students to find the angles – is measuring the angles good enough? 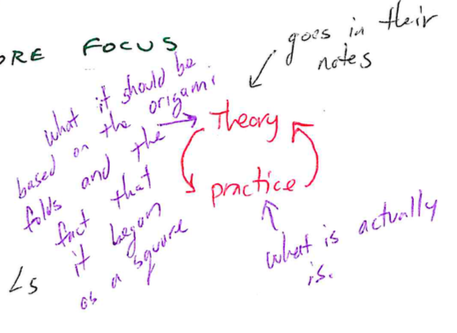 My speech is that “theory” is what the angles should be – given that we started with a perfect square and did each origami fold perfectly. They need to calculate angles based on “theory”. 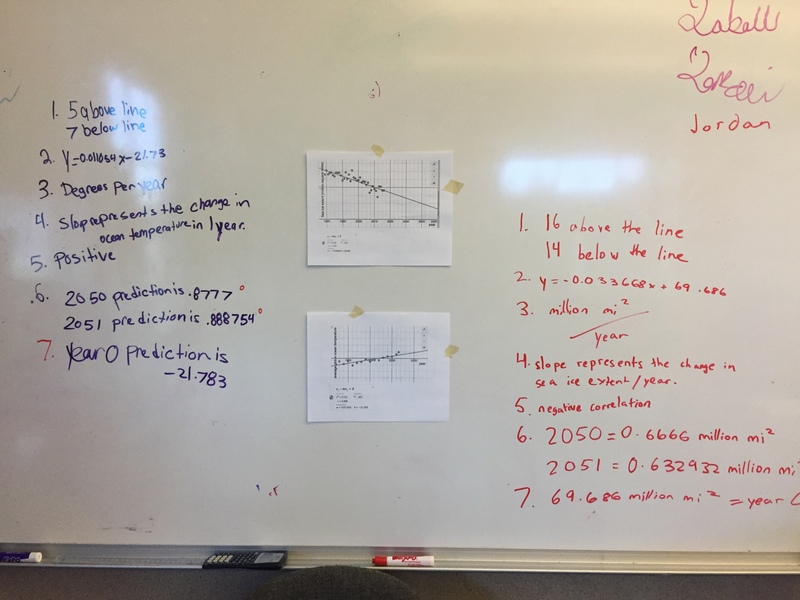 Then I have them check their calculations by measuring what the angles actually are, which is the “practice”. “There is always error in measurement” as Dave says. So I don’t want them telling me their measurements and theory are identical. At the end of the day the theory informs the practice and the practice informs the theory. For example with the duck – the students might decide that on of those four congruent angles is 45 degrees. But when they measure it they notice it is actually more like 22 degrees. 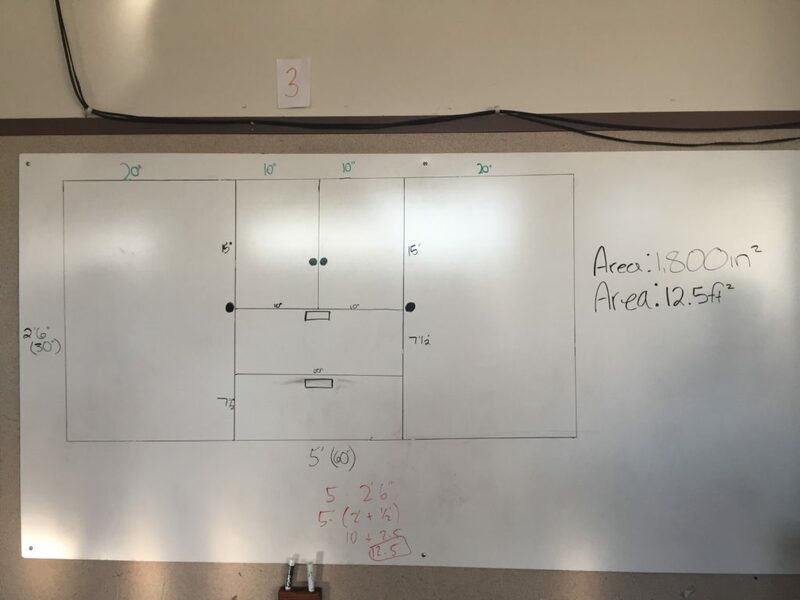 The reality of the angle provides insight into their calculation that they are not taking into consideration a bisector. I didn’t pre-fold any models. The duck is the first model I do and it has three inside reverse folds – so just be aware that they will find those difficult. If I was to pre-fold I would pre-fold 8 models to where the neck is done but not the head. Ok – that’s it. It’s just a duck afterall. 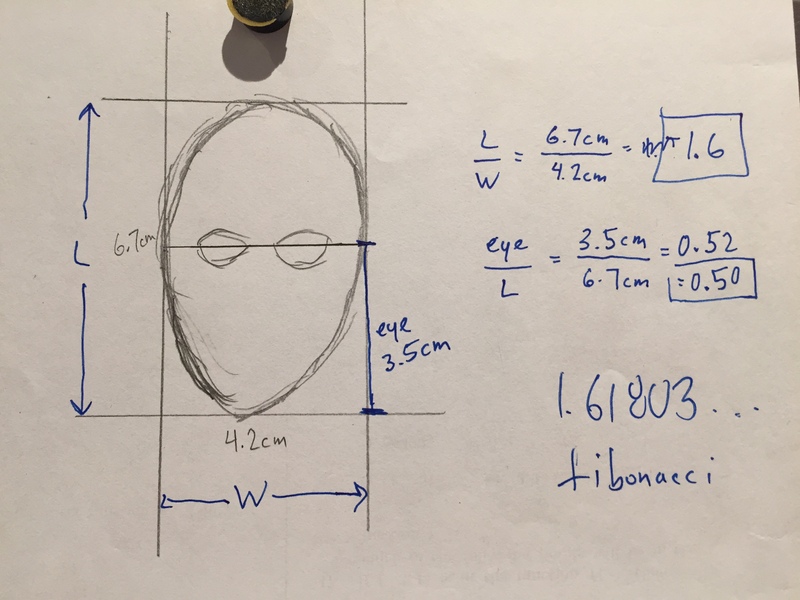 The study of the human face is great place for the golden ratio, and thus also similarity. 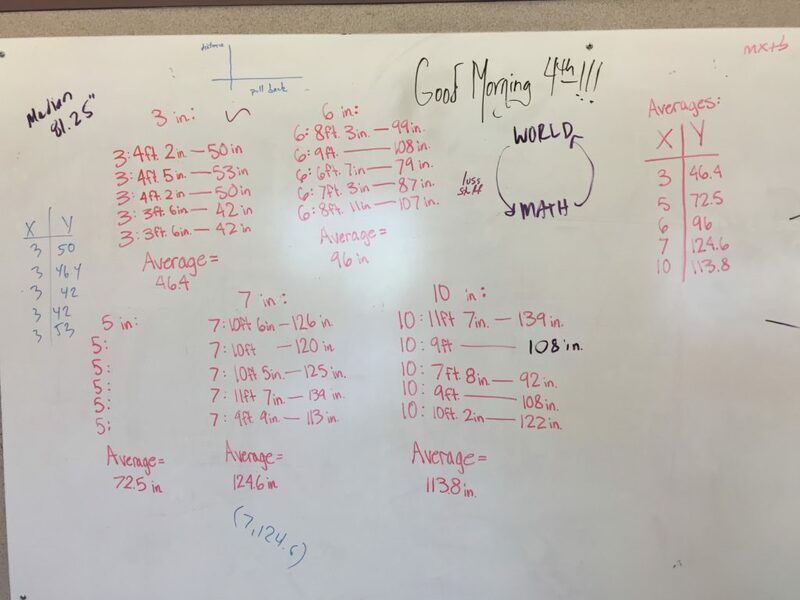 As has often been the case lately – I need to pause and say that this activity was created my incredible colleague Dave Casey who is tour de force of resources, ideas, and inspiration in the math-art intersection. Alternate mountain and valley folds. So in the image above the eye line is a valley fold, so the nose is a mountain fold, and the mouth is a valley fold. I used the height of a regular piece of 8.5X11 printer paper. 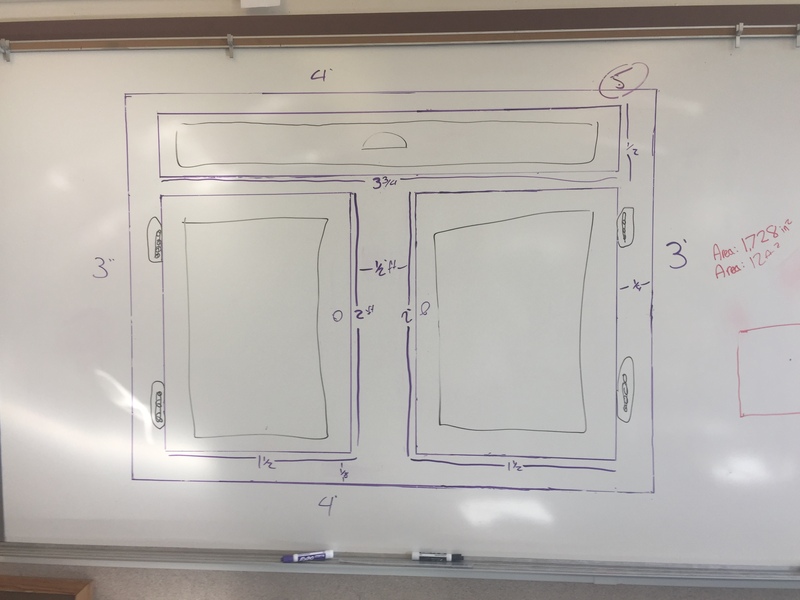 So the first fold is actually the one needed to make the paper into a golden rectangle. 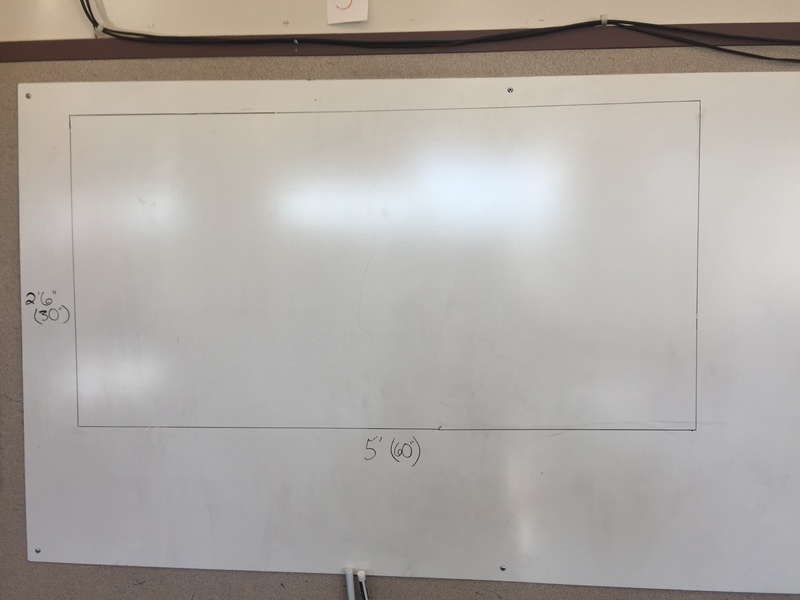 This is also the first thinking moment as the students need to figure out how wide the paper needs to be if the height is 28 cm (or 11in). It could be fun to also initially play on intuition and just hold up a piece of paper and ask them if they think it is too narrow, too wide, or just perfect to fit a human face. During the folding I was thinking of the forehead line and mouth line as a reflection of each other. Origami is great for folding reflections and it opens another avenue for review during this lesson. 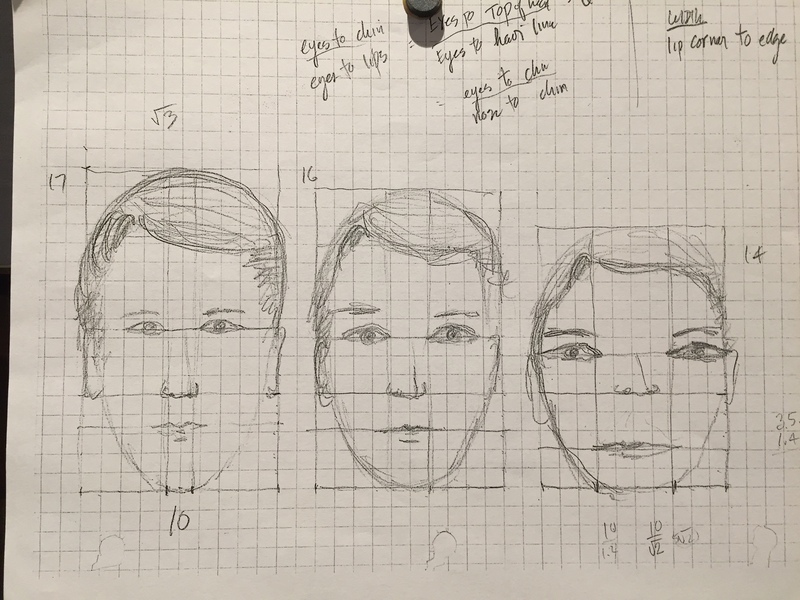 Then he has them measure the ratio of the height of the face, to the eye height. 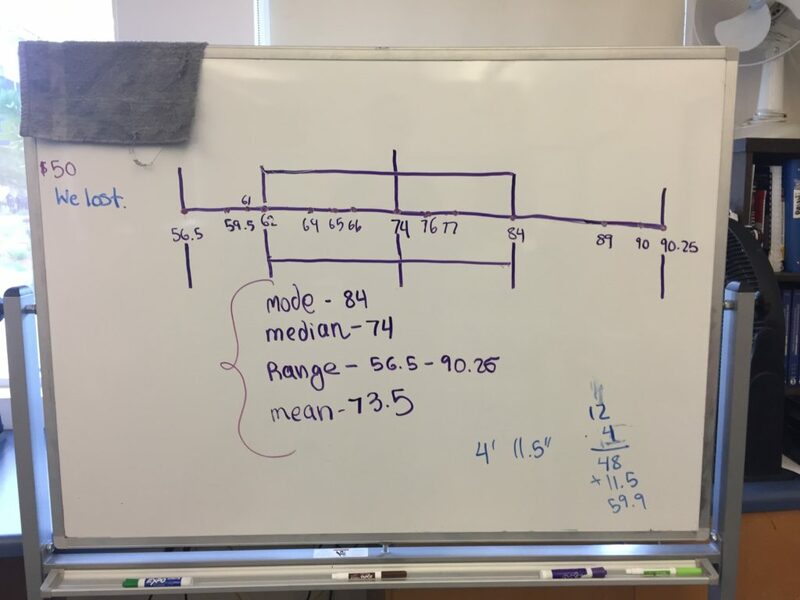 He collects all the data and has the students make a box plot. 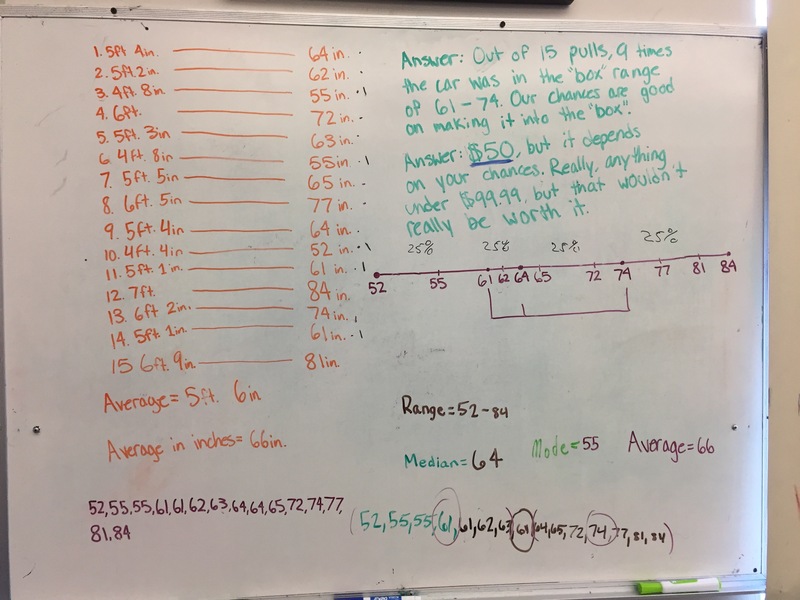 The correct answer of about 0.5 is usually outside the box! People always put the eyes too high on the face. It’s cool because now when you tell them the correct ratio is 0.5 and the eyes are pretty much in the middle the students get this ‘my intuition was wrong, I just learned something, that’s interesting, give me more’ moment. We’ll have to ask Dave for the inspiration to the lesson itself, but my inspiration for wanting to add origami to it comes from this clip from the documentary “Between the Folds” where the Eric Joisel quickly folds the rough form of the human face. This lesson doesn’t achieve the form like Eric was able to do but watching him got me playing around with the idea of proportion and origami. I would still love to have an origami face lesson more similar to what Eric created. Any one? I did learn some sad news while looking for the clip – Eric Joisel passed away in 2010. Looks like the world lost a true artist. Here is the New York Times article on his passing. 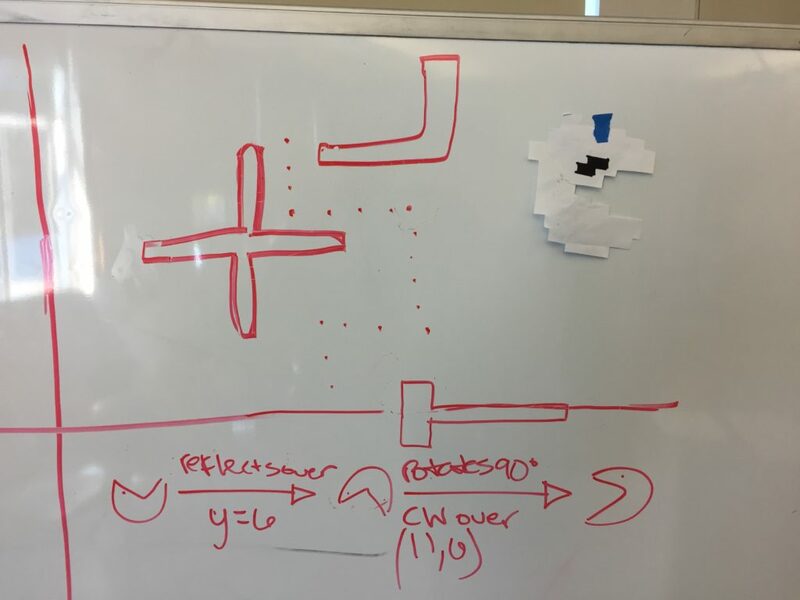 This post is about two new additions to way I taught Robert Kaplinsky’s Ms Pac Man lesson and I recommend them because they made the experience in my class even better (and it was already one of my favorites). I wrote about the lesson previously here. And Deb Boden wrote about it here. 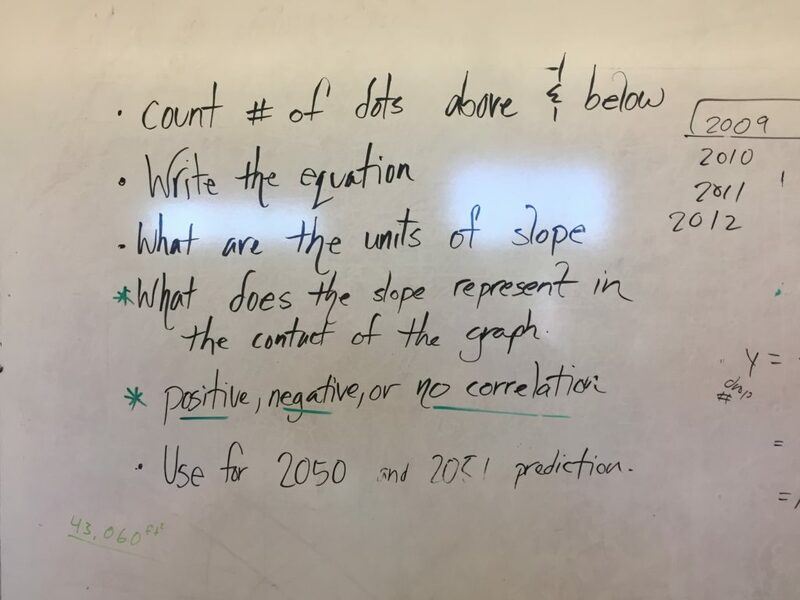 I thought of this the day before I did the lesson and I was excited about it – but I didn’t even realize the two improvements it would lead to (namely providing strategy to the game, and providing a way for students to check their solutions). 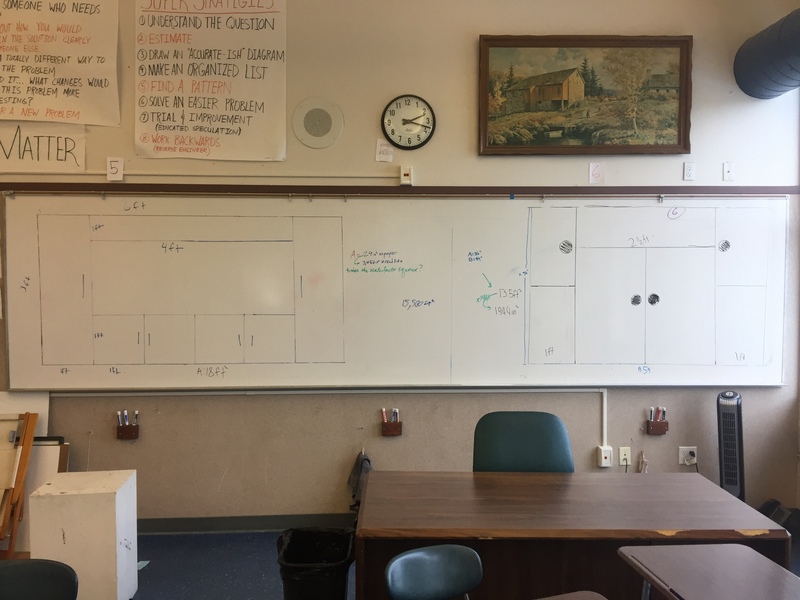 Here’s what I did: After a few students start to run into that first corner where Ms. Pac Man needs to do more that just rotate – I still waited for a critical mass and then grouped students and had them navigate that turn together at whiteboards. We had established that if she is moving up and wants to go left that she will need to do more than just rotate. When else will this be true? I gave them about 10 minutes of alone time and after that had a class discussion. #1: Now when they play the game to score the most possible points in 20 moves they can have a strategy. Minimize these moves that take two transformations. And they did! 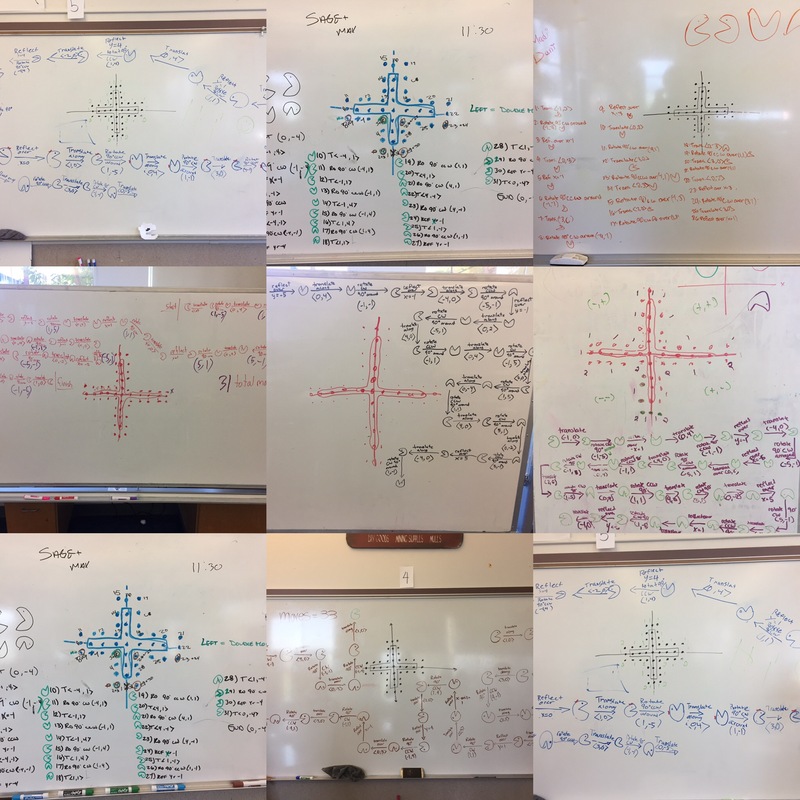 This year over half the class was even mapping out their entire path before actually recording the individual moves. 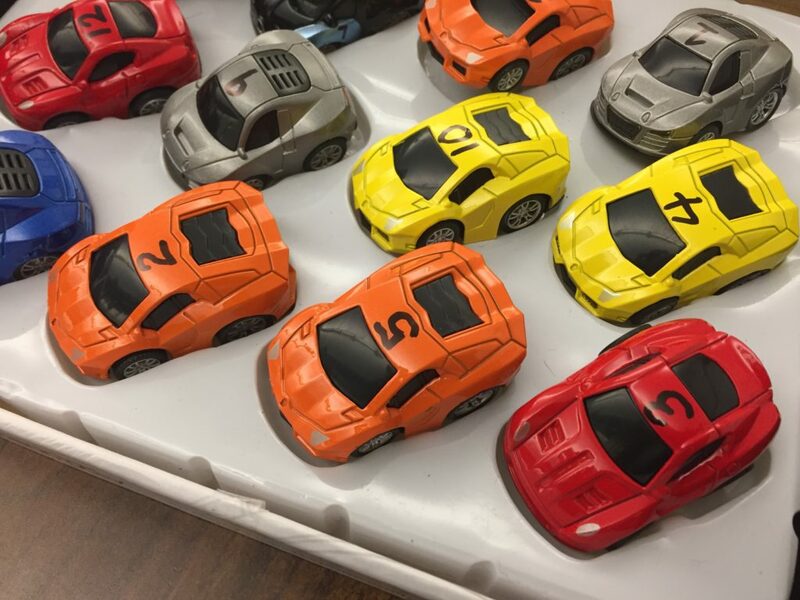 They were counting out the moves per turn and trying to minimize the number of left turns. The students recording each move also seem to be doing so with increased strategy. 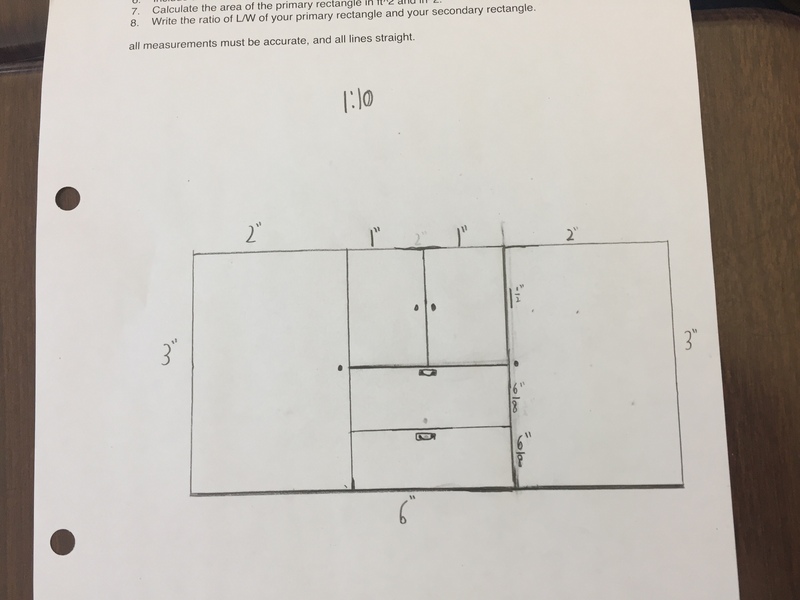 #2: If you are doing the activity Robert suggests where they figure out all the transformations to complete the path on the screen, you’ll always get some form of this question: “Mr Miller I’m done but I don’t know if it’s right”. Now you can challenge them to count up how many moves it should take based on knowledge of which turns are a double and which are a single. If they used a different number of moves then they probably made a mistake somewhere. 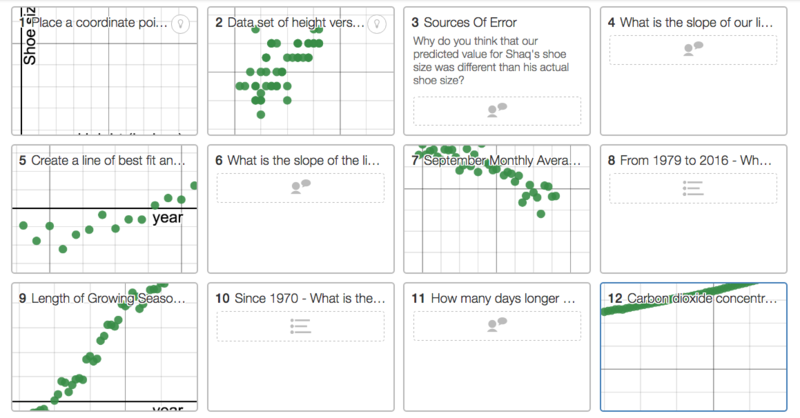 This type of self check on the answer helps extend the activity because the early finishers have something to do. 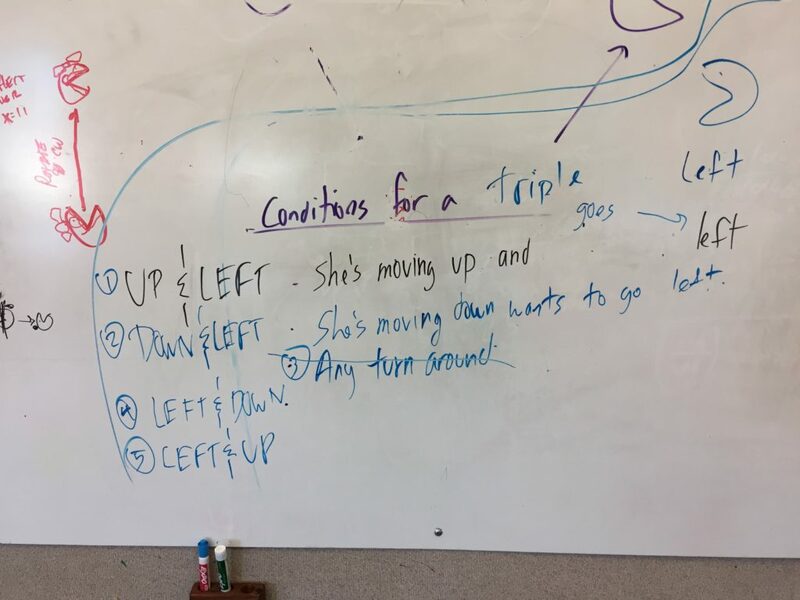 If you notice in the image above I had written “triple” move instead of double move. 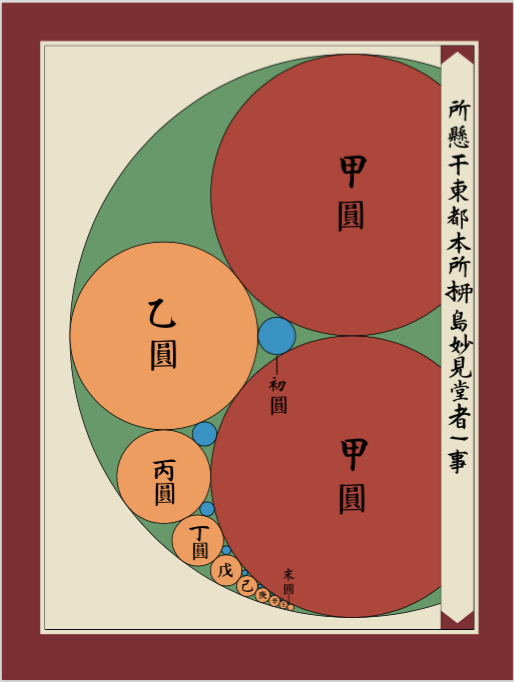 That’s because students disagreed on whether they should count the translation as a separate move or not. 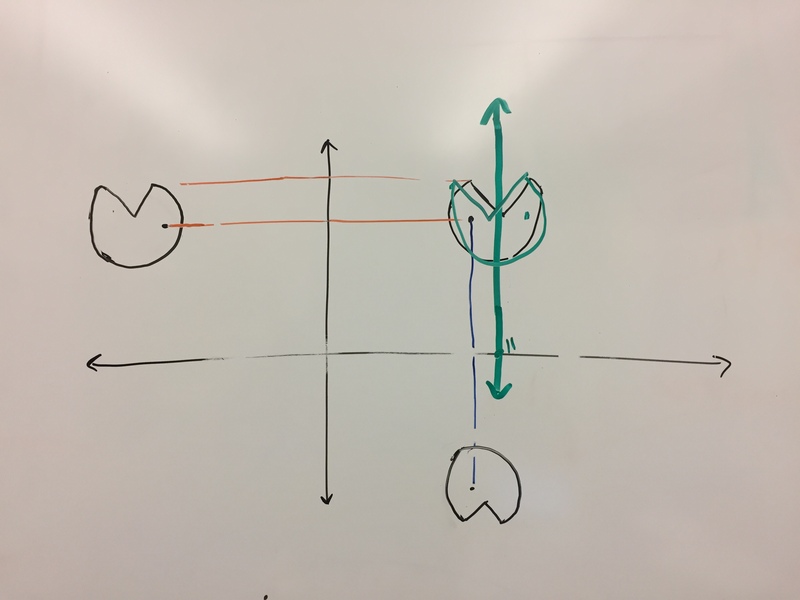 That happened because one of my students offered the beginning move as a double because it’s a reflection and then a translation. But if that’s a double, then our “double” moves (reflection, rotation) were actually triple (reflection, rotation, translation). This was probably one of the most subtle distinctions that I have had an active group conversation about with my students. Loved. Every. Minute. 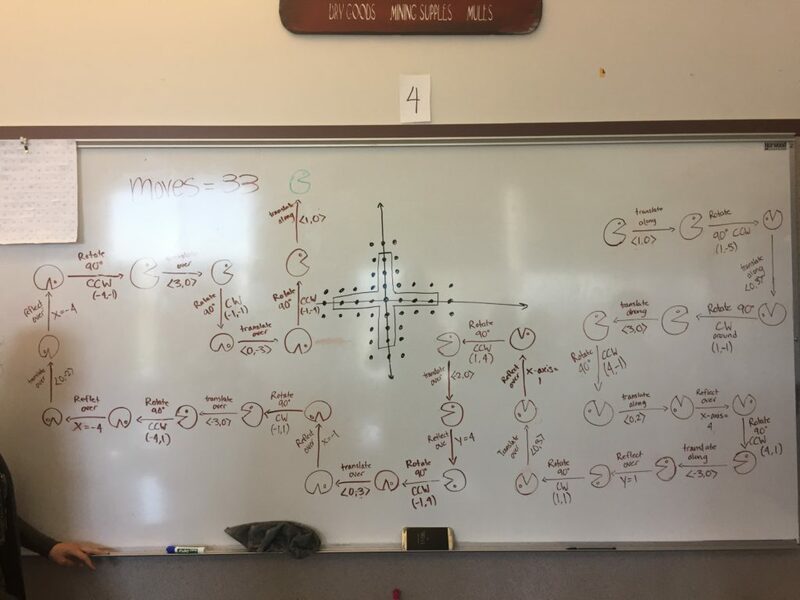 New Addition #2 – Draw the resulting orientation of Ms Pac Man after each move. I got this idea from Alex Wilson and it was very effective. I recommend it highly. Last year I just had them write all the transformations without the additional image of Ms. Pac Man. Have them keep track of Ms Pac Man’s orientation after each move. 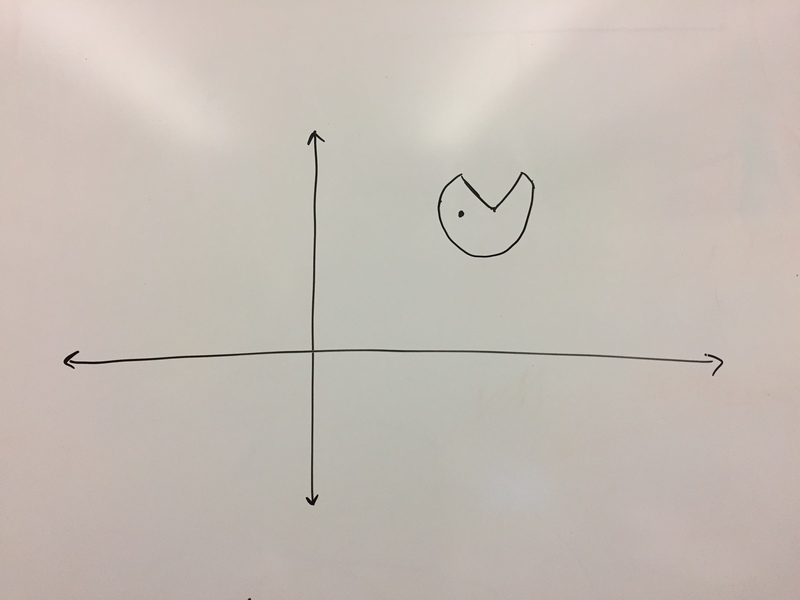 Then I told them to reflect her over the y-axis. That was pretty much all they needed to see for them to realize that Ms. Pac Man is not reflecting over the y-axis in the game. Then I had them draw a line through Ms Pac Man and reflect her over that line, as well as the x-axis. The next day, and I’m not kidding on this – not a single group of 2 students had her reflecting over the wrong line (although one group had her reflecting over points). Turned out to also be a great spiraling of reflecting shapes. 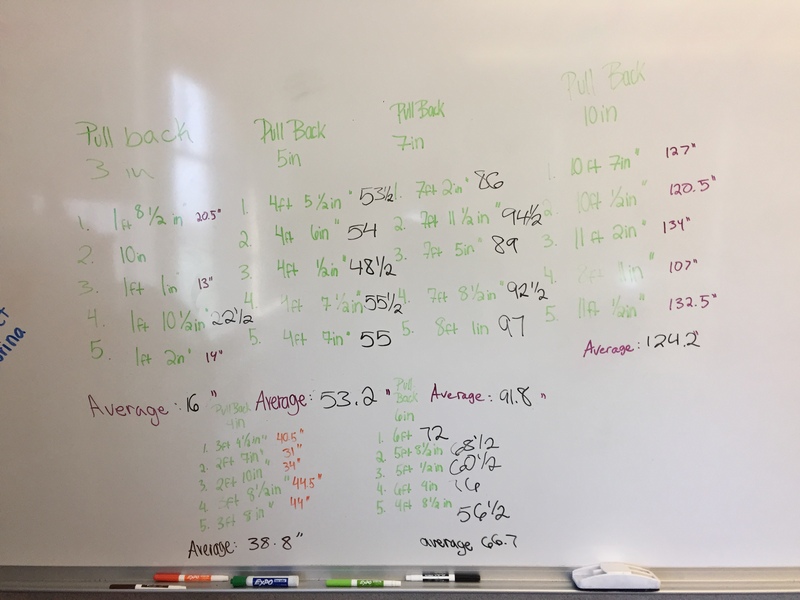 This post is really about having more in our back pocket as we try provide this learning experience to our students as best we can.